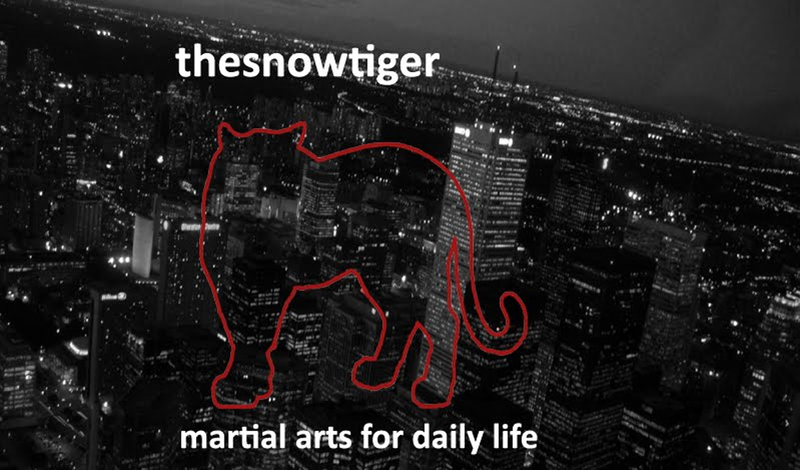 just did a seminar the other day on pressure points for a great group of martial artists over at Chimo Ryu Jiu Jitsu in Oakville, Ontario, Canada. It was a Saturday afternoon, overcast and a bit wet outside but the atmosphere on the mats was warm and enthusiastic. We began with a study of some of the hand points – Li 4, H 8 and so on – then started moving up the arm from the H7, H 6, H5 and H4 cluster to Li 11. The class really became intrigued with the subject when we began exploring how a defender can control the movement of an attacker’s body with an initial pressure point hit setting him up for a secondary, much more significant strike. My example was a downward slicing of the arm again the middle forearm area of the radius. As the defender hits the radius she curls her arm toward her. The result: the attacker’s legs buckle beneath him and his head bends forward, exposing more dangerous pressure points on his head and neck. Interest intensified when we took matters to the ground. 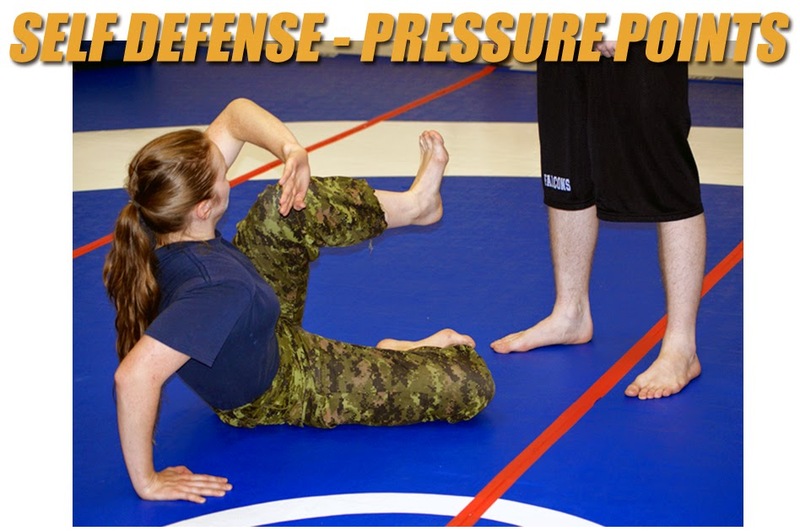 We talked about the most effective defensive posture while on the ground – legs bent in, torso upright, with one hand on the ground ready to push off, the other hand protecting the head. 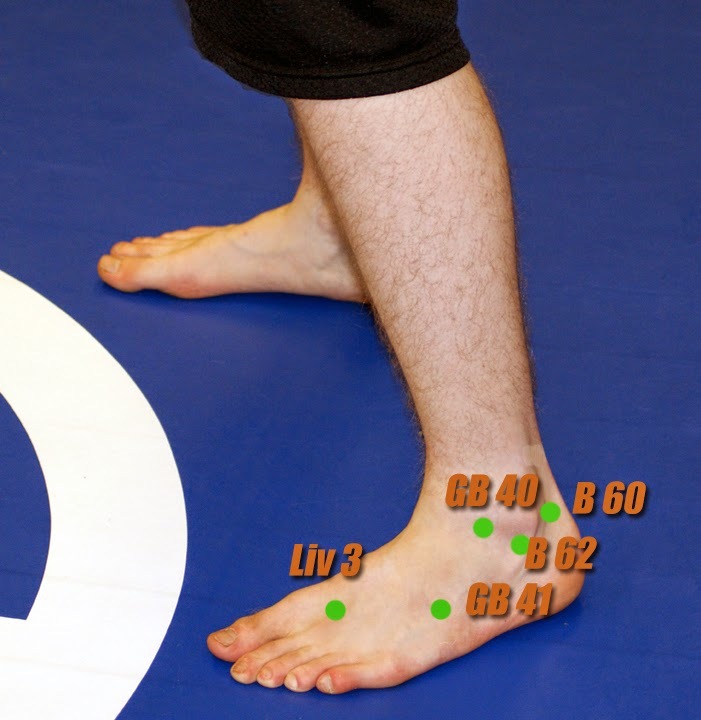 Many people aren’t used to pressure point strikes to the legs. 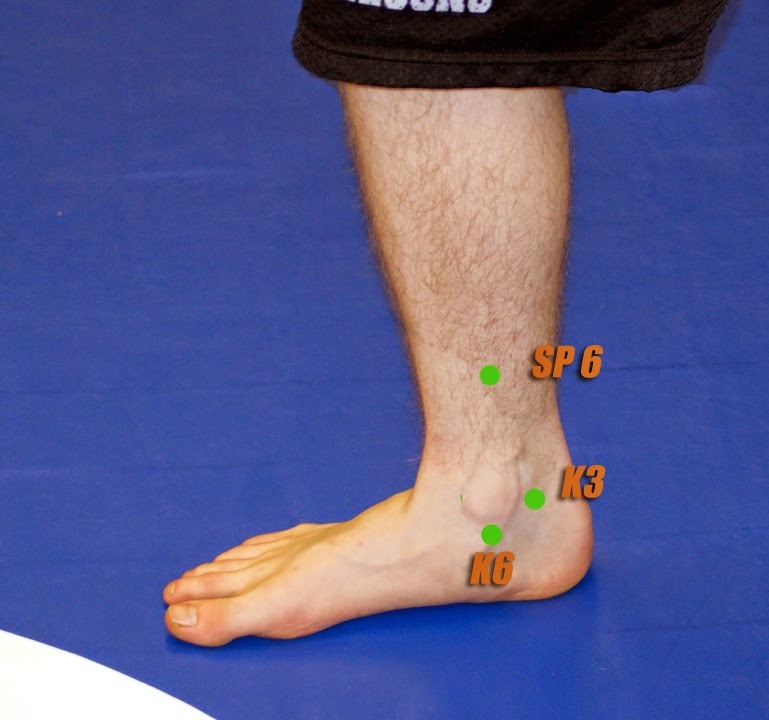 Pressure point fighters – such as practitioners of Monkey Kung Fu – hunt for opportunities at very high speed all across the surface of the legs. They use knuckles, slaps, finger tips, claws, even their teeth, or they may rely on “everyday weapons” like car keys and pens. The incoming attitude is ferocious, incoming because experienced ground fighters are never passive. In self defense, they thrive on making the ground their home. And they also know when to leave that home. I had a lot of fun training with quality practitioners on that day – and I guess that I’m still high from it and in the mood to share. Consider it as a curtain call if you will. LIV 3 – on top of the foot, in the divide between the big toe and the toe beside it , just below where the bones merge. Can be struck with a knuckle of the full fist, individual knuckles, a downward elbow strike, a stomp with the heel of the foot…etc. Most people are aware of common pressure points situated in the area of the head and throat, as well as along the arms, and perhaps on the torso. Yet some of the most accessible and vulnerable points are to be found on the legs. In the lead photo above, notice Terra’s posture on the mat. She’s curled herself up, almost into a ball, with the minimum amount of body exposed to an attack. Her one arm protects her head and upper body, the other arm has the support of the ground beneath. Indeed, she’s already halfway off the floor, or if she decides to stay, she can use that hand to add power and mobility to her kicks, or to help her turn quickly, with the least amount of effort. Because she keeps her legs in close, and her knees are flexed, she can block with her legs or kick in a variety of angles and directions. Terra’s mindset is very clear – on the ground, she is the attacker. She refuses to wait for the attacker to come to her first. Immediately, she attacks the exposed regions of his legs. Her goal: to overwhelm the attacker with as many strikes as she can muster, as rapidly as possible. In the photo above, she’s rolled from her right to her left, striking Jacob’s GB41 point full bore with the knuckles of her fist. 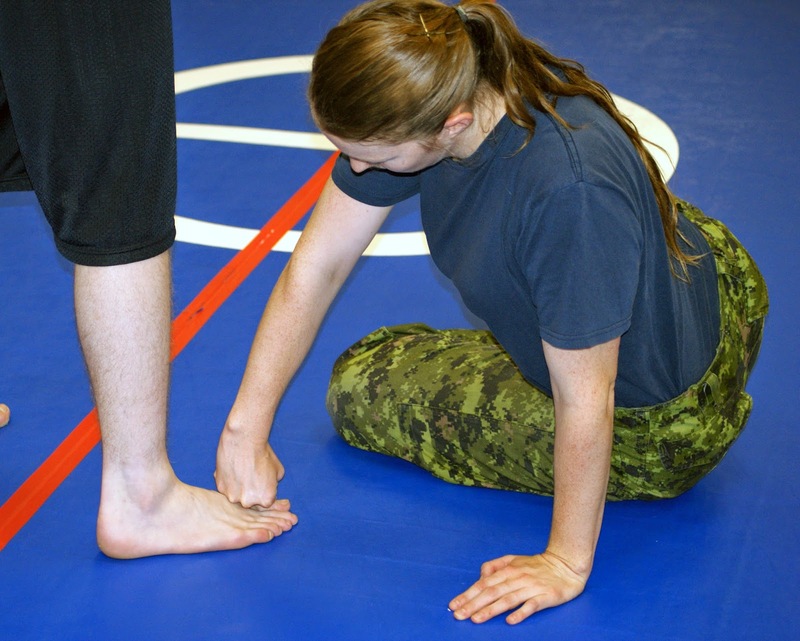 Next, she may attack the points around Jacob’s lateral malleolus, then drill a side kick over to the Sp6 point on the inside of his other leg. 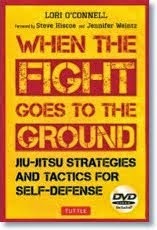 (Excellent ground fighters can literally strip meat from bone from the tips of the toes up the legs to the groin). Above, Terra has caught Jacob’s leg with her one arm. She drives her forearm forward and down into the area of his Sp6. With enough speed and body torque, she may break his tibia. From there, she mount a series of attacks against his femoral region, ending up at the groin. During practise, I put my students through time trials – so many seconds to accomplish a series of defensive manoeuvres. In Terra’s case, I may ask her to attack all the points mentioned in this post, from the ground up – and escape out the door to the count of seven. Or, if we’re in a more combative frame of mind, I may ask her to drive along the same route finishing with a neck break…again within the count of seven seconds. 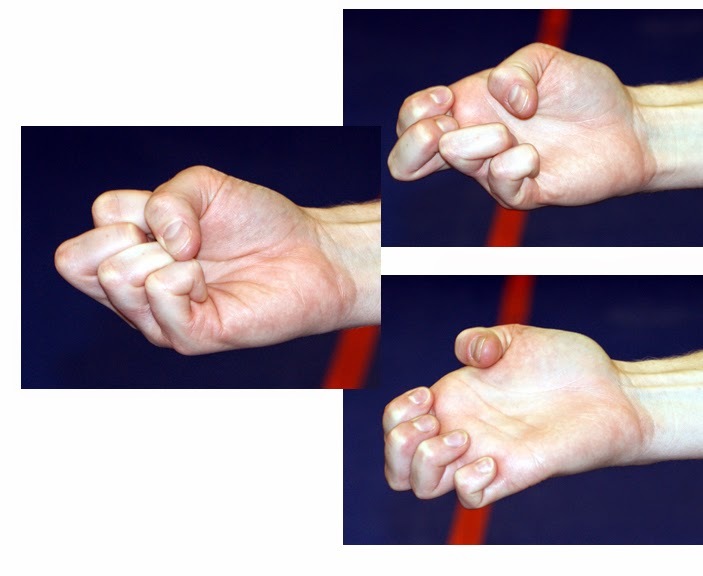 Kung Fu’s Phoenix Eye fist (the knuckle of the index finger protrudes) or Karate’s Ippon ken (the middle knuckle protrudes) are excellent tools for striking pressure point cavities. Some systems also rely on two knuckles protruding where the index and middle fingers can open to be used as claws. Then there is Karate's hiraken or Kung Fu's Leopard Paw - all fingers are bent back. Excellent for striking and for raking. A self defense situation isn’t a pleasurable experience. I want to arm my students with enough knowledge and tenacity to escape intact.